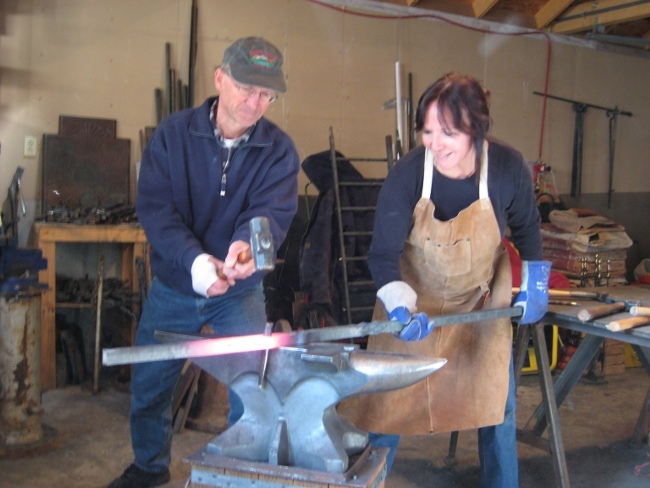 Wood & Iron Works is owned and operated by Frank Annighofer & Annette Lavalette. We have our workshop and studio in Southern Montana not far from Yellowstone National Park. The surrounding Beartooth Mountains give us solitude and inspiration. 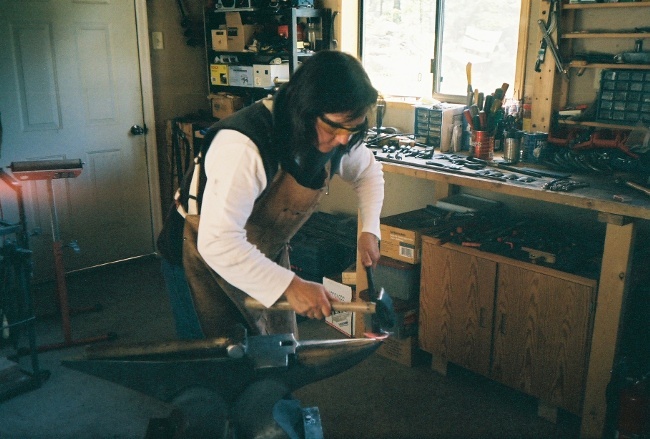 The nearby communities of Red Lodge and Absarokee allow for exchanging ideas with artists of all kinds. Our medium is metal. Iron and bronze are our favorites. Whenever possible we like to employ classic blacksmithing techniques. 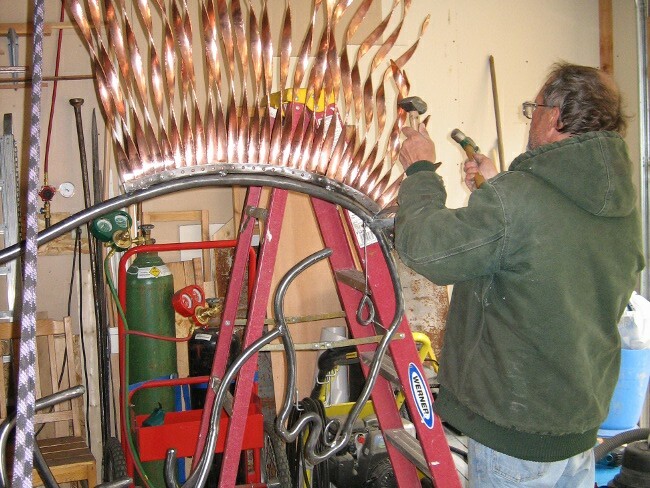 These allow a most natural design and harmonic flow in our art pieces. We like to assemble rails and gates with old European classical blacksmith motifs as well as contemporary forms. And we also like the challenge to try something new. You give us a theme: We translate it into wrought iron or bronze. Forged iron partners very good with natural wood. Many of our projects incorporate both, wood and iron. That's why we came up with our name: Wood & Iron Works. Iron can be the heavy and solid part of that creation or it can be the other way around: Solid logs and playful iron like the stairway on our first page. 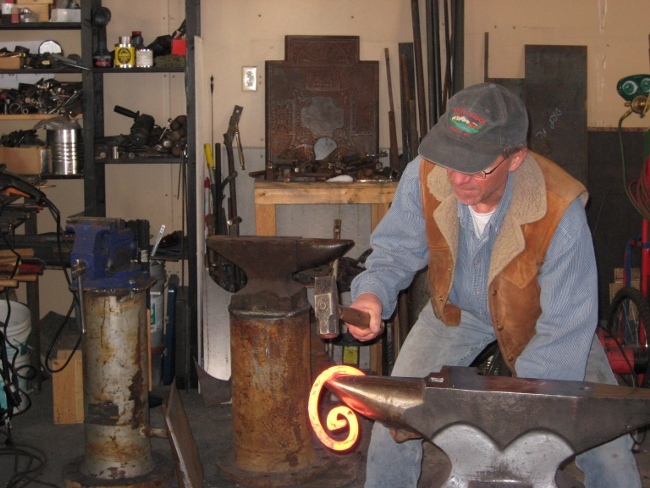 We are members of ABANA, the American Artist Blacksmith Association, CBA, the California Blacksmith Association, and NRBA, the Northern Rockies Blacksmiths Association. Frank currently serves as President of NRBA. Frank always had an artistic talent. He has been handcrafting little sculptures and training his eye in photography since childhood. Frank learned blacksmithing in the late 1960s/early 1970s in his father Dieter's shop in Hamburg, Germany. 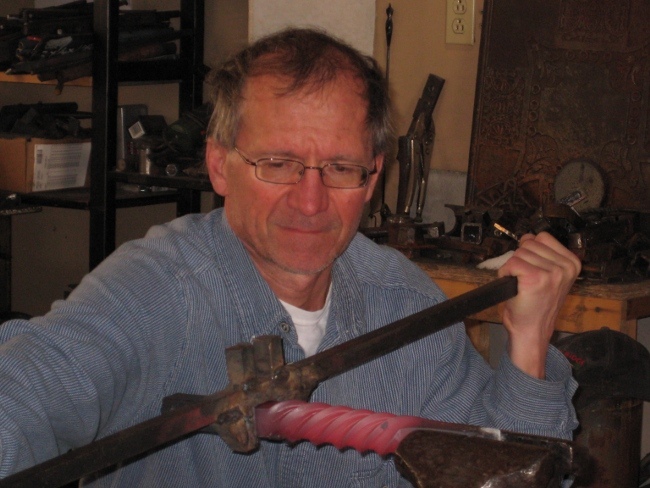 In these years he traveled around in Germany and Italy to take photographs of blacksmithing art to bring new ideas into the family business. Frank learned the basics of blacksmithing just like his father Dieter had learned them from his father, Frank's grandfather, Arthur. 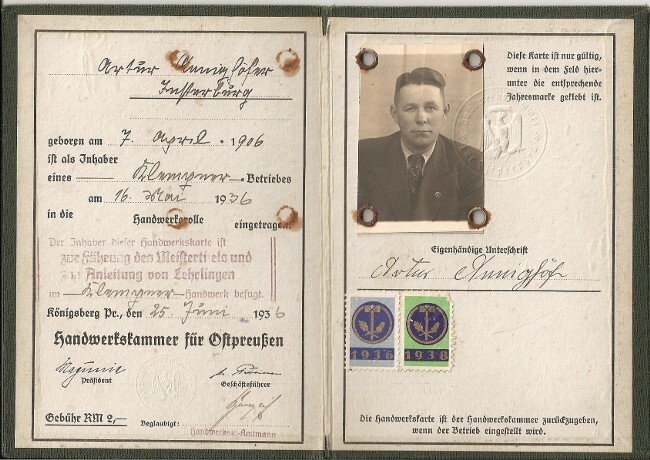 Arthur Annighofer ran a small copper and iron smithing business in Insterburg in East Prussia. He received his Meisterbrief (master diploma) in 1930. 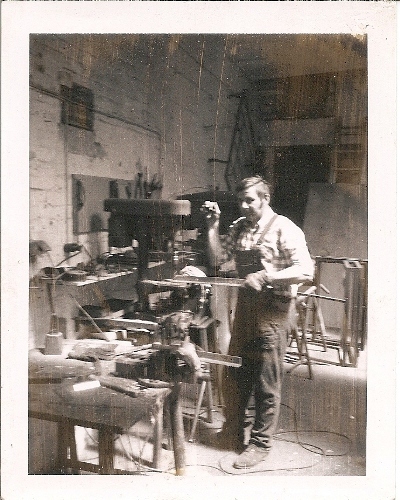 It was hard to make a living from pure blacksmithing at the time Frank apprenticed with his father. Machine fabricated pickets and scrolls came on the market that looked almost like hand forged. And only few people had the money to afford traditionally handcrafted metal art. Frank decided on a different career. After receiving his PhD in polymer sciences he worked in different functions from research to marketing, from consulting to general management in the US, Germany, Switzerland and Italy to name just a few. It would take until 2003 when Frank and Annette decided to quit the business tread mill and to go back to their roots. They moved to the solitude of Montana's Beartooth Mountains where they have built quite a reputation as artists and handcrafters since then. Annette grew up in Rissen, then a rural suburb of Hamburg, Germany. Being born to a German mother and a French father gave her a touch of both cultures. Sometimes her art shows detail and precision, some times she allows it to flow with her thoughts. Annette was raised in a family where self sufficiency was always valued highly. She learned to, butcher her own meat, bake bread and make wine. And she learned to fix all and everything around the house. These are skills she honed over the years and still practices today. After high school Annette was accepted for art school in Southern Germany. But it was family tradition (or at least her father's strong advice) to have a real job. This excluded art and other youth fantasies. So Annette became a chemist and later an environmental consultant. She worked on projects around the world.